Personalized Friendly Folks caricature in a drink coaster - Shipped quickly! All text shown on this product is for sample representation only. We will personalize your caricature scene per your instructions. Very unique and personalized Friendly Folks cartoon in a drink coaster! Even if you are shopping at the last minute or trying to find the perfect item for the person that "has everything", aka "hard to buy for", our drink coaster gift is a great idea - and it doesn't break the bank! 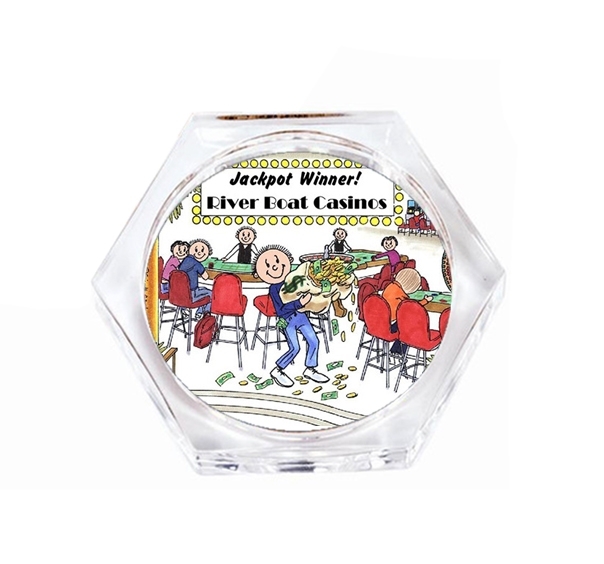 Made of crystal clear acrylic, our drink coaster measures approximately 3-1/2" x 3-1/2" (edge to edge), with your 3" personalized Friendly Folks scene housed in the center. Our coasters are scratch resistant and sport a cork backing, with raised drip-free edge. Our Friendly Folks scenes are created upon order, and similar to our Christmas tree ornaments, will either have white space and/or some of the background scene may be cropped, to create a unique and nostalgic "moment in time" appearance. For these reasons, your personalized coaster might slightly vary from our samples. If you have any specific requests, please do not hesitate to make a note in the "special instructions" or contact us with your comments, questions or concerns.